Andrew Clark has been blowing down pieces of metal tube ever since he first emptied his grandmother’s kitchen cupboard and found a funnel before the age of two. A graduate of the Guildhall School of Music and Drama, studying with horn professors Halstead, Chidell and Bryant, he performed with many orchestras and ensembles using both period instruments and their modern counterparts. Highlights of his career include many years of playing principal horn in London Classical Players (Norrington); Orchestra of the Age of Enlightenment; Academy of Ancient Music (Hogwood); English Concert (Pinnock); and Amsterdam Baroque Orchestra (Koopman) with whom he recorded Bach’s Cantatas. As a soloist he has made several commercial recordings: concertos by Vivaldi, Fasch and Crusell; works for horn and piano by Beethoven and Czerny; the Brahms Horn Trio, Mozart’s Horn Quintet, Beethoven’s Sextet and the Sonata da Caccia by Thomas Ades. He was also a horn teacher at London’s Royal Academy of Music for seventeen years and at the Guildhall School of Music and Drama for ten years. He has performed in forty countries, but is now attempting to tour less often to reduce his carbon foot-print. 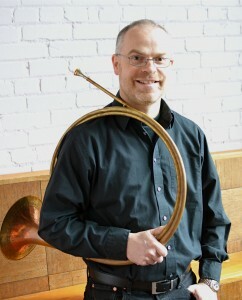 In 2010 Andrew moved from England with his wife, bassoonist Katrina Russell, to Vancouver Island. He has set up a horn making workshop there, building customized instruments for himself and for colleagues around the world. Since 2011 he has played principal horn with the Vancouver Island Symphony Orchestra.